You can have the freshest bait, the sharpest hooks, the most expensive rods and the fastest boat. But if you can’t get your anchovy or herring to spin properly, odds are you will come back to the dock with an empty fish box. Perhaps the biggest key to ocean salmon fishing is getting your bait to spin properly. Without that seductive roll, most salmon will simply swim away as your bait is trolled by them. (Above) Guide Andy Martin nets a king off the coast of Brookings, Oregon, for a customer. In more than a decade of running guided saltwater trips for salmon, I’ve learned the perfect spin is often the difference between limiting out and not even scratching out a fish. Good, fresh bait is important, and so is clean, quality gear, but the spin of the bait is what triggers the strike. (Above) Pautzke’s Fire Brine is prefect for toughening up bait for trolling, and adding enticing colors. I usually always troll for ocean kings with a combination of herring and anchovies. Some days the kings like the herring, and at times all they will bite are anchovies. 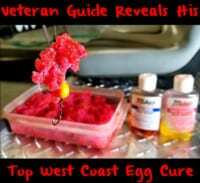 While bait fished straight from the tray will work, brining it first will make it more durable, while adding color also can make the difference of getting bit and coming home empty. 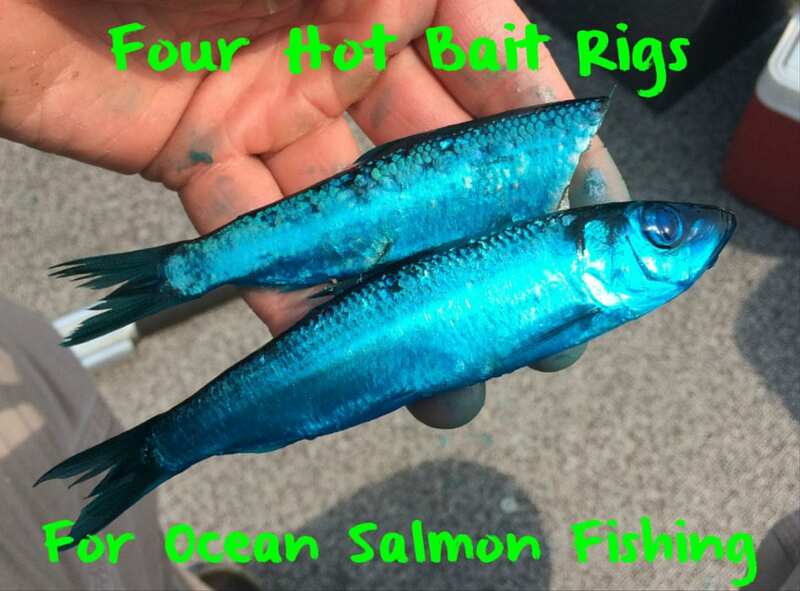 (Above) Herring brined with blue Pautzke Fire Brine is one of guide Andy Martin’s favorite ocean salmon baits. I like to use Blue, Green, Chartreuse and Natural Fire Brine. Most days I carry a couple of colors of baits, as well as natural-colored herring and anchovies. Day-to-day, salmon seem to prefer different colors. I will take several trays of bait from the freezer just before going to bed and thaw them in the fridge. Early in the morning, I add the thawed baits to the brine. You can brine the frozen baits, but the herring and anchovies must first thaw before they will brine, and for the brine to work best, they must soak for three to four hours, minimum. I keep the brined baits in a cooler in the boat. It is important to keep the baits cold. (Above) A whole herring rigged with an FBR (Franko Bait Rotator). The FBR is perhaps the easiest way to rig a herring or anchovy and get it to spin. Simply lift the pin, place the head of the bait in the rotator, and release the pin into the top of the bait. The FBR delivers a super-tight spin. I like to fish the baits I intend to place deepest with the FBRs. (Above) A plug-cut herring with a solid-tie mooching rig. Plug-cut herring are my favorite salmon baits. Salmon often can’t pass them up. Plug-cuts also produce the most flash of any trolled salmon bait. I use a solid-tie mooching rig with twin 3/0 hooks. The top hook is the key to producing the spin. Pass the hook through the backbone and instead of going straight to the top of the back of the fish, place the hook between the 1 o’clock and 2 o’clock position. 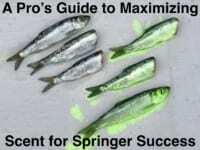 Plug-cut herring often separate the top guides from novice anglers, as they can be the most difficult bait to perfect. (Above) A whole anchovy fished with a Krippled Anchovy. Sometimes salmon don’t want herring, and anchovies must be used. Anchovies are more delicate than herring, and it can be difficult to get them to spin. The Krippled Anchovy helmet is nearly fool proof. Use them to put a slight bend in the bait for a tight twirl that coho and kings will both pounce on. Another extremely effective way to rig an anchovy incorporates a toothpick to get a slight bend, resulting in a super-tight roll. This is the first time I have shared this deadly rig. (Above) A small rubber band is used to keep the gill plate cover closed, which prevents the mouth of the anchovy from opening. When trolling anchovies, it is vital to keep the mouth of the bait from opening. If the mouth opens, which often happens with a straight anchovy with no helmet, you will lose the spin, or the bait will pull off. For my rig, I use a dental rubber band over the gills to keep the mouth closed (the mouth cannot open if the gills are pinned shut). If your favorite tackle shop doesn’t have these small rubber bands, your nearest dollar store will. (Above) Give the anchovy a slight bend, but with a reverse bend. Instead of arching the anchovy with a forward bend, I give them a reverse bend. This will create one of the most effective rolls you have ever seen. It is important to brine your baits first, however, as anchovies tend to have a soft belly, and this roll will cause the guts of an unbrined bait to tear out. (Above) Slide a toothpick from the vent toward the top of the head to maintain the bend of the bait. A toothpick is used to keep the bait bent. Run the toothpick from the vent to the back of the neck of the bait. Just a slight arch is all that is needed. (Above) Place the top hook from the lower jaw to the top of the nose. When hooking the “anchovy toothpick rig,” run the top hook of a solid-tie mooching rig from the bottom of the jaw to the top of the nose. For this rig, I leave the second hook as a trailing stinger. I use the same leader that I use for plug-cut herring. If anchovies are all that you will be trolling, use a smaller top hook. The closer you place the hook to the tip of the nose, the tighter the bait will spin. With barbless hooks, sometimes a smaller hook will hold the more delicate anchovy better, as a larger hook can tear through the nose, especially if the bait is not brined. Editor’s Note: Guide Andy Martin runs ocean charters out of Brookings, Oregon, during the summers, and guides on the Chetco, Smith, Coos, Elk and Sixes rivers during the fall and winter. His web sites are wildriversfishing.com and brookingsfishing.com. He has been a Pautzke pro staffer for 10 years.